Nicole's Needlework: Back from Georgia! 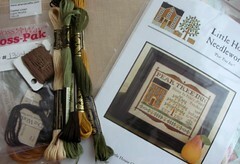 I was thinking of starting Little House Needleworks Pear Tree Inn. There is a SAL going on over at the LHN Yahoo Group. I can never resist a SAL and I'm bored with my other projects. I don't know what's wrong with me. I've been feeling anxious lately for some reason. Maybe because I quit my job working at Publix (grocery store) while I was in Georgia. My maternity leave had ended and I was contemplating working just one or two days a week, but decided to just cut my ties since I'm now working for my brother. I love working for my brother, but I don't always have a lot to do. I'm not complaining... I'm just used to working all the time! I do love staying home with the kids. I wouldn't trade that for anything. Anyway, I guess I was feeling "lazy" like I should be working more... Silly, I know! Especially since the kids keep me very busy! Well, speaking of kids... The baby is crying... I'll write more later!